Chief Minister Mulayam Singh Yadav today drew the attention of the Left parties to the manner in which the Congress in the state had joined hands with the BJP and the BSP to stall the election process in his pocket borough — Mainpuri. 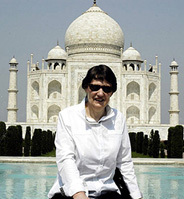 New Zealand Prime Minister Helen Clarke during her visit to the Taj Mahal in Agra on Sunday. The infighting in the Trinamool Congress (TMC) has now come out in the ‘street’ following a direct confrontation between the party supremo, Ms Mamata Banerjee and the city Mayor, Mr Subrata Mukherjee, her nominee in the Kolkata Municipal Corporation. Fodder scam accused-turned-CBI approver, Dipesh Chandak, has alleged before a CBI court that the RJD president Laloo Prasad Yadav was paid Rs 55-60 crore from the Bihar Government treasuries during the early 1990s. Rashtriya Janata Dal president and Railway Minister Laloo Prasad Yadav has got a place in the prestigious Limca Book of Records for the distinction of being the longest serving president of a political party in the country. President A.P.J. Abdul Kalam has strongly disapproved of the tendency among people to avoid coming to the rescue of accident victims, fearing they might get into some trouble. The Pakistan government finds itself caught between a rock and a hard place over its seven-month-old military operations against Al-Qaida elements in South Waziristan Agency in Federally Administered Tribal Areas (FATA). Amidst growing pressure to check underworld don Dawood Ibrahim, who has been declared "specially designated global terrorist" by the USA, his ISI masters in Pakistan have directed him to carry out attacks in India or support would be extended to a new group led by his detractors. Ooty (Tamil Nadu): Dog lovers in north India beware. There is a gang operating in south India whose tentacles are spread all over the country and even in Chandigarh and Punjab. They kidnap dogs and sell them for their hide and meat. The boycott of the mid-day meal prepared by a Dalit woman by over 100 schoolchildren of a particular community has lead to caste tension in a village near Modinagar, official sources said today. Former Director-General of the Indo-Tibetan Border Police Gautam Kaul and Cinemaya editor Aruna Vasudev are among four Indians who have been awarded the ‘Star of Italian Solidarity’ medal. The Indian National Trust for Art and Cultural Heritage (INTACH) has put a proposal before the Ministry of Defence for shifting Sainik School from Jagatjit Palace in Kapurthala and establishing a national defence university there. Jagatjit Palace is under the purview of the Ministry of Defence. External Affairs Minister K. Natwar Singh on Friday met Foreign Minister of Thailand Surakiart Sathirathai in Bangkok. Bollywood comes out in support of sacked Censor chief Anupam Kher. CPI (M) gives 4-point demand during landmark peace talks between the AP Government and Naxalites. Asked whether she would be able to face the DMK-led Democratic Progressive Alliance (DPA) in the next Assembly elections she hinted of a change in the political equation in the state, commenting, “Wait and see”. The Chief Minister was critical of the neighbouring Congress Government in Andhra Pradesh and reiterated her opposition to legitimise Naxalite groups in Andhra Pradesh through official negotiations. With the ruling AIADMK completing its 32nd birth anniversary today Ms Jayalalithaa visited the party heaquarters here and addressed a press conference. Ms Jayalalithaa cited the state government’s economic turnaround after inheriting an empty treasury in 2001 as her main achievement. Chief Minister Mulayam Singh Yadav today drew the attention of the Left parties to the manner in which the Congress in the state had joined hands with the BJP and the BSP to stall the election process in his pocketborough — Mainpuri. Charging "some senior ministers and central officials" of " being part of the conspiracy by presenting false and baseless complaints to the Election Commission", Mr Yadav pleaded with the Election Commission to ignore these complaints and complete the polling process in the two constituencies. Clearly uneasy about the Election Commission's decision to stay counting in the Lok Sabha byelections at Mainpuri and the Assembly constituency of Karchana following a large number of complaints of misuse of official machinery and poll violence, Mr Yadav tried to turn the tables by hinting at an understanding between the Congress and the BJP. To substantiate his point he said the Congress had compromised its position when it had decided to sit in a dharna with the BJP and the BSP in the major square of Mainpuri town a day after the polling in Mainpuri on October 13 in which two persons were killed. Defending the high polling percentage in Mainpuri, Mr Yadav went back into history. Quoting results of the Lok Sabha elections 1957 onwards as well as the results of recent local body elections, he maintained that his party was the natural "choice of the predominantly rural Yadav voter of the region". Charging the parties which have lost their base for conniving to stall the unprecedented win of his party in these two constituencies, the CM singled out the Congress and said that it had been reduced to a laughing stock with almost all its candidates forfeiting their security deposits. Recently Mr Sudip Bandopadhyya, one of Ms Banerjee’s close aides, Dr Nitish Sengupta, former bureaucrat-turned-TMC MP, and Mr Tarun Adhikeray, MLA, left the party following differences of opinion with her. They have formally rejoined the Congress (I). Soon several other TMC MLAs, leaders and workers will also join the Congress (I) in protest against Ms Banerjee’s high-handedness and arrogance, according to party sources. The Mayor seems to have earned Ms Banerjee’s wrath after he refused to carry out her ‘order’ of not inviting the state Chief Minister, Mr Buddhadeb Bhattacharjee, to the inauguration of the revamped Star Theatre in the Shambazar area on Wednesday. In protest, Ms Banerjee did not turn up at the function. Instead she organised another function at South Kolkata’s Uttam Manch on Wednesday evening itself to celebrate the launching of the party’s weekly mouthpiece, ‘Jagoo Bangali’ (Rise Bengali). All MLAs, leaders and other workers of the party were directed to be present. But many MLAs and leaders skipped the meeting to be at the Star Theatre re-opening function. Addressing the gathering there, Ms Banerjee warned party leaders and workers that she would not allow any one to indulge in double standards. She warned that these leaders would be thrown out if they did not voluntarily quit the party. Mr Mukherjee, however, said he had not done any wrong in inviting the Chief Minister at the Star Theatre’s inauguration function. The Chief Minister in his turn was not only present at on Wednesday opening function, but also congratulated Mr Mukherjee’s gesture and his efforts in re-building the historic Star Theatre which was destroyed in a fire 13 years back on October 13. Deposing before the CBI Special Judge, A.K. Sengupta, in connection with a fodder scam case relating to the Ranchi treasury yesterday, Mr Chandak alleged that about Rs 55-60 crore had been withdrawn fraudulently and paid in cash to Laloo Prasad Yadav, who was then Chief Minister of undivided Bihar. Mr Chandak, who owned a fodder supply firm that existed only on paper, said he had been close to the alleged kingpin of the multi-crore fodder scam, Dr S.B. Sinha, the then Assistant Director of the Animal Husbandry department, and had knowledge of the functioning of the department during the scam. He alleged that Rs 15 crore had been paid to Mr Yadav in two instalments before the 1995 Assembly poll in Bihar. Rajo Singh, Indradev Prasad Verma, Bhola Ram Toofani, Ranjan Yadav and Maulana Asami were among other state politicians who received money through Sinha, Mr Chandak alleged. On Sinha’s direction, a supplier of fodder and medicine, M.S. Bedi, had given Rs 50 lakh to the former Bihar Chief Minister and another fodder scam accused, Jagannath Mishra, after Sinha returned from Australia in 1994, Mr Chandak alleged. Sinha had gone there for kidney transplantation and Mr Chandak and his wife had accompanied him. Rashtriya Janata Dal (RJD) president and Railway Minister Laloo Prasad Yadav has got a place in the prestigious Limca Book of Records for the distinction of being the longest serving president of a political party in the country. Mr Yadav was handed over the certificate by the Limca Book of Records officials here last week, sources close to the Railway Minister said today. Mr Yadav is serving as the president of RJD ever since 1997, the party was formed in the month of July. The situation, Dr Kalam said, was prevalent mainly because of the fear of medico-legal issues. People are apprehensive of coming to the rescue of the victims. Even the hospitals demanded the presence of the police and the completion of formalities before they could start treating the patients. “This, I think, is not a desirable situation,” a press statement said. Inaugurating the annual general meeting of the Indian Red Cross Society and St John Ambulance here, he suggested that the Red Cross and the St John Ambulance come forward with a scheme in which whenever an accident occurred, a message could be sent to their nearest ambulance team, which must arrange immediate medical help. Many times the “non-availability of timely medical intervention leads to fatality of the victim. This can be overcome by the intervention provided by the Red Cross team,’’ he added. The President said a legal mechanism might be worked out for facilitating the role of the Red Cross kind of organisations for providing such emergency support in critical situations. These operations have resulted in heightened terrorist attacks against the Pakistani establishment and led to widespread discontentment among tribesmen. Now boxed in between US forces in the west and Pakistanis on its east, the tribal militants of FATA are helping their “Islamic brethren” fight against the government and military, which they feel is acting at the behest of the USA. Though the tribals have promised to hand over foreign militants and not extend any support to "Islamic brethren" associated with Al-Qaida, going by the precedent, it does not seem that they will stick to their promise. Their resentment has led to their activities spreading in various other parts of the country such as Karachi and Quetta. Lately, terrorists have struck targets in major cities and carried out assassination attempts on prominent people. Attacks on President Pervez Musharraf on December 25, 2003, on the Karachi Corps Commander, Lt-Gen Ahsan Saleem Hayat on June 10, 2004 and the July 29 attack on Prime Minister Shaukat Aziz (when Mr Aziz was PM-designate) seem to give an indication of this deteriorating situation. The operations had to be carried out on a large-scale- helicopters, tanks, heavy artillery and mortars were used. This reflects the organisational training and the arms available with Islamic terrorists. At another level, these facts can be used by India in countering Pakistani propaganda against actions of Indian security forces in Kashmir and elsewhere. The operations were launched on March 16, 2004, a day before the visit of US Secretary of State Colin Powell to Islamabad on March 17-18. There were suggestions that the action was a result of US pressure. 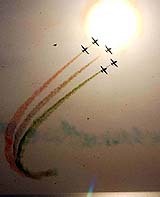 The operation of March 2004 ended in initial retreats for the Army. There were also reports that some of the senior officials, including Brigadiers, refused to fight against the tribals and JCOs had refused to follow orders. The army terminated one phase of its operation on March 29, released most of the prisoners (the government the government freed 141 out of the 163 detained after the March 2004 operation). In the end, the military did not manage to capture any top Al-Qaida operators. The Pakistan government, through "intermediaries", entered into "peace talks" in a place called Shakai with five tribal leaders, which led to a ceasefire in the last week of April. Differences started to erupt on May 10 when militant tribal leader Nek Mohammad said the registration of foreigners was not part of the Shakai agreement. The announcement of amnesty was not received well by the USA. Some US officials criticised Pakistan's counter-terrorist strategy and questioned its commitment to wipe out Al-Qaida form the border areas. On May 4, Lt-Gen David Barno, Chief Commander of the American forces in Afghanistan, said: "There are foreign fighters in those tribal areas who will have to be killed or captured"; "It's very important that the Pakistani military continue with their operations to go after the foreign fighters in particular, who in my view will not be reconciled with the government." The US army has intruded into FATA through Afghanistan eight times since March 2004. This was in spite of a strong remark by Pakistan Foreign Minister Khurshid Mehmood Kasuri that a mistake does not remain a mistake if oft repeated. FATA is a predominantly tribal area of Pakistan along the northwestern border with Afghanistan. This 600-km-long and 130-km-wide narrow belt with an overall area of 27,220 sq km is inhabited by just over three million people. FATA includes seven political agencies Bajaur, Mohmand, Khyber, Kurram, North and South Waziristan-as well as six Frontier Regions-- Peshawar, Kohat, Bannu, Dera Ismail Khan, Tank and Lakki Marwat. The Frontier Regions are tribal areas attached to the districts but exclusive of tribal agencies. According to intelligence inputs and statements of some underworld members arrested in the country recently, his masters in Karachi have asked Dawood to set his house in order and step up violent attacks in India. ISI has already readied a group led by Anwar, brother of Chota Shakeel, comprising Syed Muzzafar, alias, Munna Jhingda and Yusuf Ghodrawala to substitute Dawood, official sources said quoting the reports. While Anwar is in Dubai, the other two shuttle between Thialand and Pakistan. “Gourmets who think they are having a good mutton ‘biryani’ in Bangalore are perhaps eating dog meat,” she said. In the case of big and long-haired dogs like Great Danes and Saint Bernards the kidnappers paint them as tiger skins while for breeds like Labradors and German Shepherds the hides are painted as leopard skins. Mr Nigel Joseph Otter, an officer of the Animal Welfare Board, who also runs a shelter for animals near this town, 600 km from Chennai, concurred. “Two weeks back there was an incident which will shock all animal lovers. We rescued 17 dogs from a hotel here, which were to be transported to neighbouring Karnataka. Dogs were being kidnapped from here and sent to Bangalore where the animals are skinned for their hide while the meat, which is a ‘delicacy’ for Korean expatriates, is sold in eateries there.” Mr Otter alleged. The shocking practice came to light when people saw a chained dog being dragged by one Manju in the streets which was bleeding from its mouth. Manju was handed over to the police. His arrest helped the retrieval of 17 canines from a private lodge in this hill station. An effort is under-way to trace their owners. Investigations revealed that the skins of dogs are sold to unsuspecting clients as hides of leopards, tigers or stags. The children of Government Primary School at Magla Moosa village refused to eat the food provided under the mid-day meal plan of the Uttar Pradesh Government during the last week as it was cooked by a Dalit woman. The SDM of Modinagar, Mr S.S.V. Ranga Rao, said. Historian Lokesh Chandra and Italian Consulate, Chennai chief R.K. Shahney are the others to receive the state award given to foreigners for their contribution to promote relations between India and Italy through culture. Mr Kaul, a music administrator and film critic, is presently the secretary of Delhi Symphony Society. He is responsible for presenting several operas of Italian composers and is credited with creating a better understanding of Italian cinema in India as a senior official of the Federation of Film Societies of India. Ms Vasudev heads the Cinefan, which promotes good cinema in Asia. She is also the director of the Cinefan Asian Film Festival in the Capital. Dr Chandra is a renowned historian and indologist while Mr Shahney is the honorary Consul-General of the Italian Consulate in Chennai. Italian Ambassador Antonio Armellini will present the medals on October 18 at the launch of the Italian Language Week celebrations. INTACH Chairman S.K. Mishra on Thursday said the trust had also sought Rs 3 crore for restoring the palace, for which a comprehensive report had already been sent to the ministry. 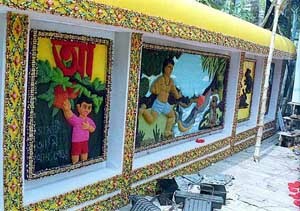 The ministry, he said, had agreed in principle to fund the restoration work, details of which were being worked out. INTACH, he said, was also trying to organise funds from the World Monument Fund, besides other sources, including the corporate sector, for the restoration of Qila Mubarak in Patiala and had drawn an estimate for the conservation work at Sheesh Mahal Palace there. Meanwhile, fans of classical music in Punjab are in for a major treat with the first of the three heritage festivals, organised by Punjab Heritage Societies of Amritsar, Kapurthala and Patiala, in collaboration with INTACH, beginning in the backdrop of Jagatjit Palace in Kapurthala from October 18. The three-day Baba Jassa Singh Heritage Festival will showcase the rich cultural heritage of Punjab in which some major stalwarts of India and Pakistan are slated to perform. The Thai Foreign Minister said after the meeting that the talks were comprehensive and covered all aspects of bilateral relations. He emphasised Thailand’s Look West policy and said this policy and India’s Look East policy were complementary. According to a Foreign Office spokesman here, Mr Natwar Singh mentioned that terrorism was a worldwide scourge and recalled that it was decided at the BIMSTEC Summit meeting to jointly combat this scourge.